Warwick Shutters professionals do what they do best. Always knowing you're covered under our guarantee. Quality New Faux Wood Shutters are expertly hand crafted in the UK and come with a reassuring 10 year manufactures guarantee. Wood Shutters (Paulonia, Basswood & MDF) are manufactured to the highest quality and are covered with our 2 year guarantee, Vinyl Shutters are as equally stunning as they are practical. Vinyl Shutter come with a 5 year guarantee against warping, cracking, fading, chipping, discolouration and peeling. Pure Style & Elegance. Warwick Shutters are the latest design from Luxaflex ...Our flagship design completely waterproof and 99% we sell are in pure white, No maintenance Internal plantation shutters from Warwick Shutters. 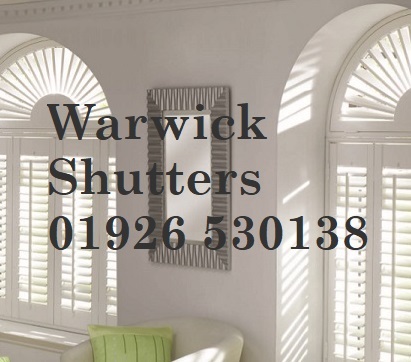 Warwick Shutters 01926 530138 Areas We Cover.